**Items received for consideration. Post contains affiliate links. All thoughts are 100% my own. Psst... did you hear the news? Illustrated Faith now has their very own journaling Bible available at Dayspring! And let me tell you, it's a BIG deal. It's the first Bible like this that has truly been designed just for art journaling--- thicker white pages. spiral bounding to lay flat, larger margins to work in, etc. Is it any wonder that the Illustrated Faith community went absolutely CRAZY on release day!? They could not wait to get their hands on it. And I'll be honest, it's at the top of my own wishlist too! First and foremost, we're going to look at the Shine Elastic Pen Holder. First and foremost, this is absolutely stunning. I love the gorgeous style and the vivid colors. But style aside, it's also very useful. It slides around your journaling Bible and holds two pens, so you can keep them with you anywhere you go. 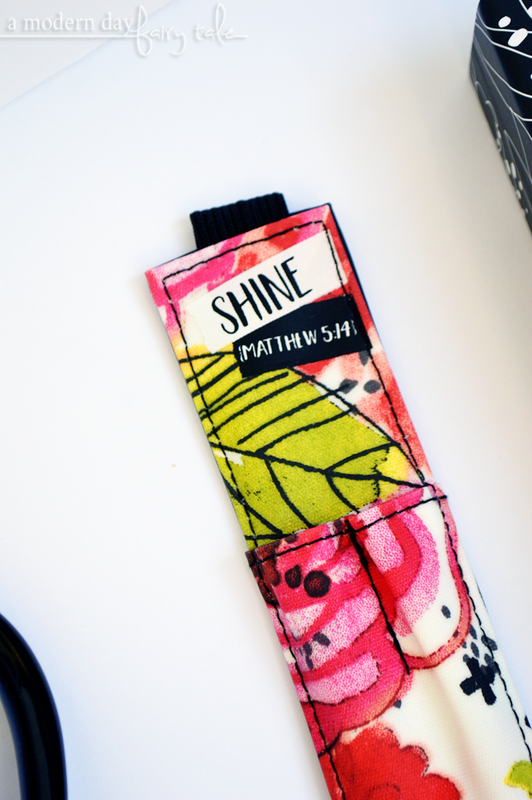 But, it's not just great for Bible journaling, you can also use this with a planner, a regular journal or anywhere you might need to have a few pens on hand. Personally I plan to use this on my church Bible so that I can always have a pen handy, and show off a little bit of my personal style too! You know what goes GREAT with Bible journaling time? A nice hot mug of coffee! 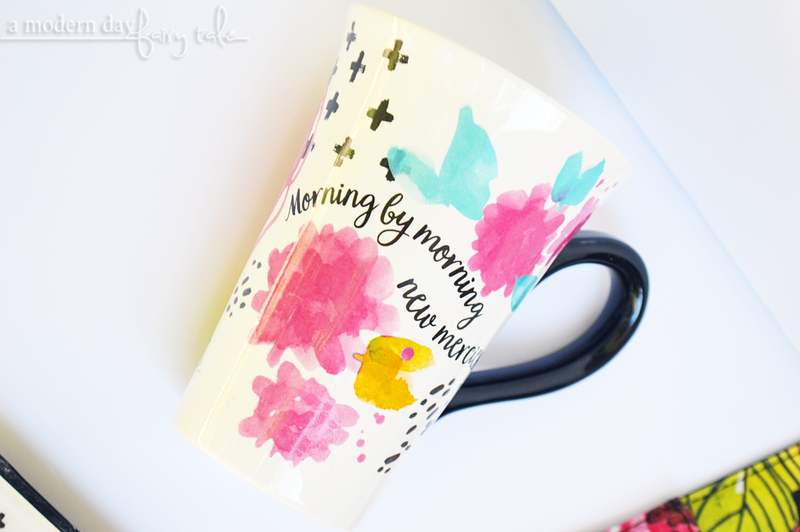 And this fantastic New Mercies Inspirational Mug allows us to do so in style. I must admit, I have just a slight obsession with Dayspring mugs in general. I have several, and always find they are the ones I reach for for those positive messages each and every morning. And this one just might be my most favorite! 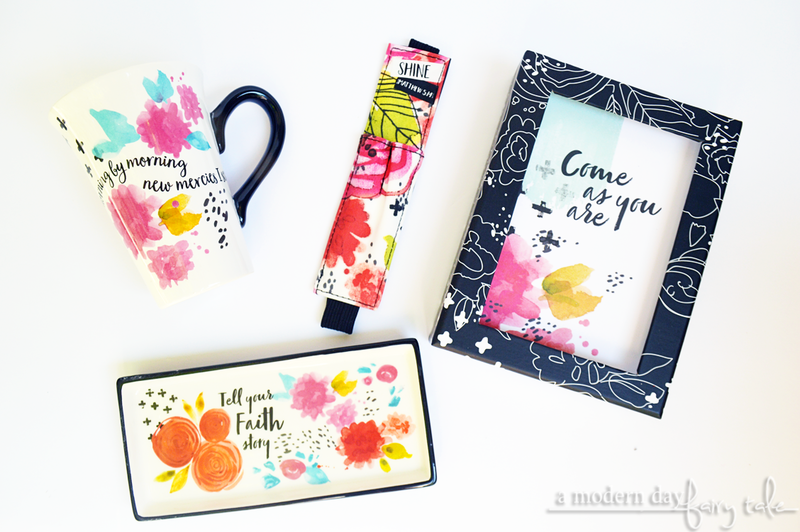 It takes everything I love about Dayspring's other mugs (the great quality, the fantastic messages, etc) and combines it with my love of Illustrated Faith's style! It's bright, it's colorful, it's cheerful... everything I need to get my day started. 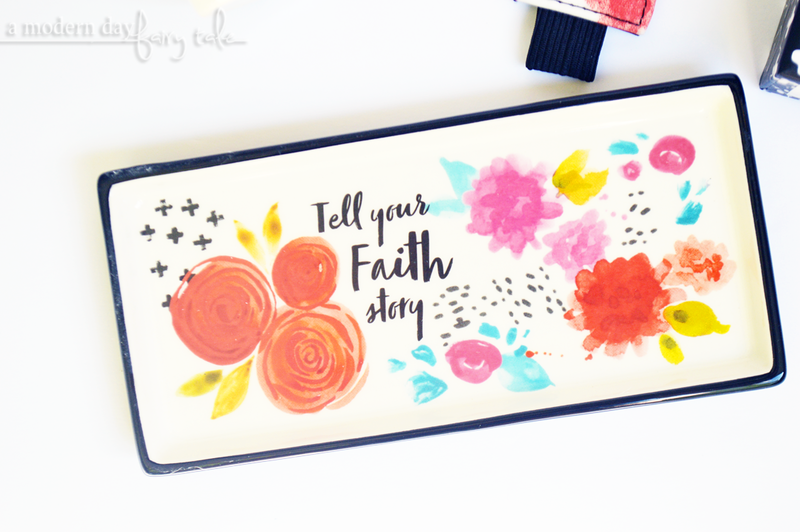 Next up, is the Tell Your Story Pencil Tray. Again we see this same gorgeous style, but in a cute way to keep your journaling area or office organized. It's the perfect size to hold a handful of pens, and the message lends perfectly to that. Tell your story. I love that. I also love that this is one piece that can be used in a variety of ways. Yes, I personally intend to use it for the intended purpose, but you could use it for rings or earrings, bobby pins, lipsticks, etc... or put it on display as a fun little piece of decor! You know what they say, save the best for last and I most certainly did that here. My absolute favorite of the new items has to be Wow God Art Print Set Display. It features a really cute shadow box type frame and a variety of gorgeously illustrated messages that you can change around to best suit your mood, or the message you need to hear right now. And while all of the included images are fantastic--- just the style we've come to expect and love from Illustrated Faith- that's not even the best part! Have you ever been working on your own Bible journaling and fell so in love with a piece that you wished you could put it on a display. I must admit, I'm far from an artist but have had those moments before. It was not necessarily because I felt that the art itself was display worthy, but because it meant something to me. A verse or a theme that was important to where I was and what I needed in the moment. With this set you CAN have the option to display your own work too. 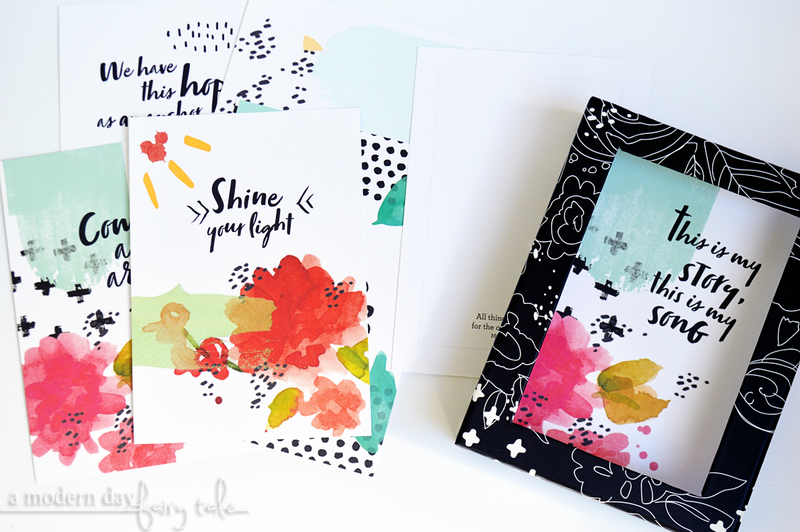 On the back of each card is a space and a prompt that allows you to illustrate YOUR faith, and put it on display. I must admit, I'm not sure I'll ever use this option myself, but I certainly like that I could if I felt led to do so! How absolutely gorgeous are all of these new arrivals!? The best part for me is that these items are not JUST for Bible journalers. Yes, some of them will certainly come in handy in helping us to create an inspiring work space, but they are perfect for ANYONE who enjoys the beauty in Bible art, even if they don't join in themselves. They are a great way to display your faith, no matter where you are. Want to see more great items from Illustrated Faith? Head on over to Dayspring to see it all. Which new Illustrated Faith items are your favorite? How would you use them in your journaling, office or home?